This is a VERY uncommon version of the Rolex Air-King Date. This early version (from 1968) was amongst the last of the “Explorer style” dials which have numerals at 6 & 9. 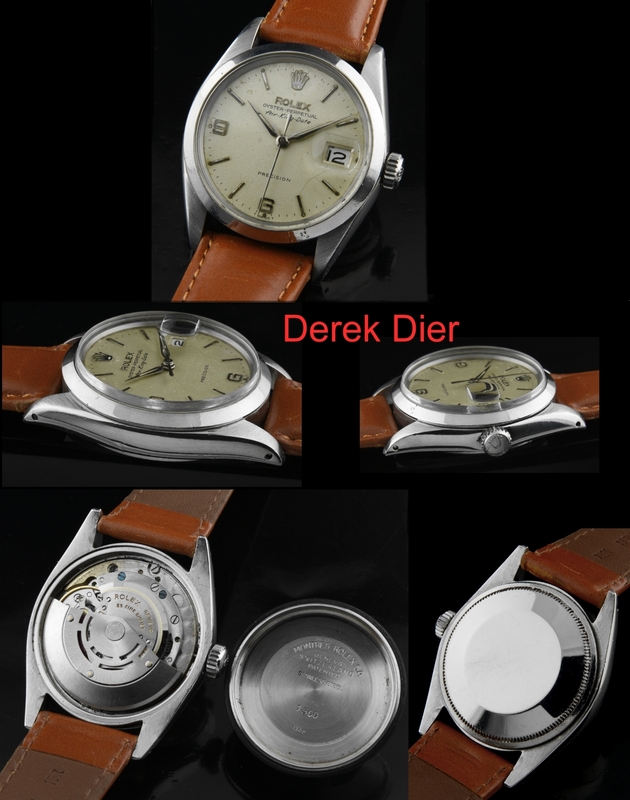 This dial is completely original, with aged raised steel markers, steel Rolex insignia and ROLEX wording. The mark on the dial stretching between 4&5 is MUCH less visible with the naked eye. The ageing and spotting is also less visible in person-remember, my pictures are close-up and brightly lit. In person, this dial has a great vintage look. Finding original dials such as this is becoming quite uncommon. Another very appealing feature of these earlier ROLEX watches is the original Dauphine hands, and this dial has the original lume intact. The lume plots on the dial are also all original and all present. The steel case is very clean-only some tiny pitting in the bezel-again, hardly visible with the naked eye. The 35mm. stainless steel case displays very fine condition and is without dings or scratches. The fine automatic winding ROLEX movement was just cleaned by our watchmaker-accurate and working perfectly. 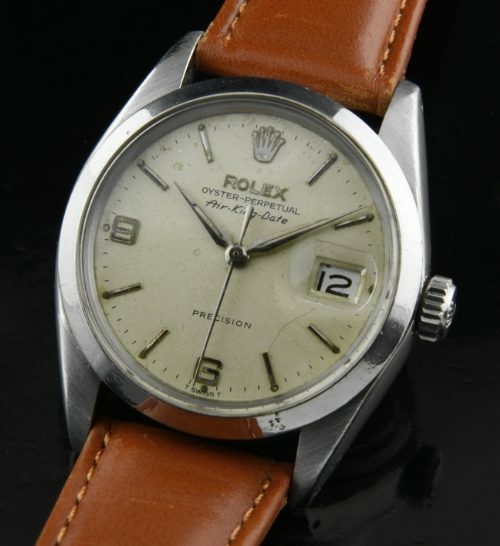 The AIR KING DATE was sold mainly in Canada and Commonwealth countries only-it was not available in the USA, so much fewer examples exist when compared to other ROLEX variations. The date is the feature making this watch uncommon; as the regular and common AIR KINGS do not have the date. Normally, you will see these watches selling for $3500 or more.